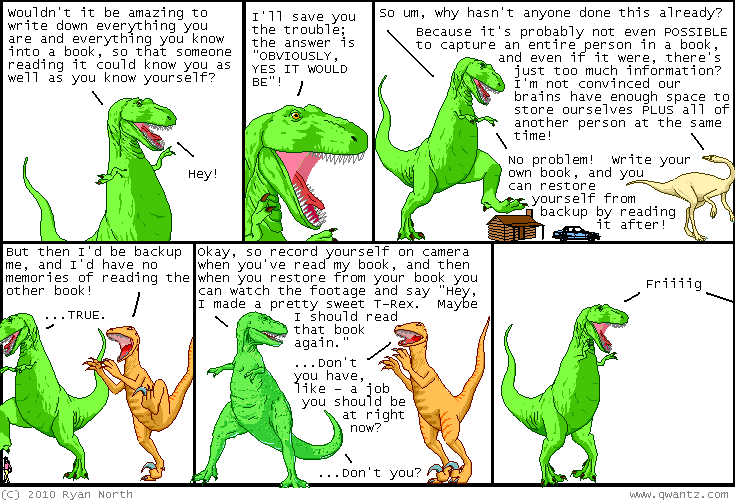 Dinosaur Comics - October 28th, 2010 - awesome fun times! –I know you want to, Dromiceiomimus! October 28th, 2010: The Machine of Death story keeps getting weirder / more awesome. American conservative talky guy Glenn Beck called us out on his show yesterday because it turned out that his book also had its official release date on October 26th, and he was upset that it was in third place to Keith Richard's new autobio "Life" and our little book. He told his listeners that he'd worked on his book for over a year, and that his books always debut at #1, and that we (along with Keith) were part of a left-wing "culture of death" that "celebrates the things that have destroyed us" and that everyone should support life by buying his book instead of ours? So now he's the #1 book on Amazon, and I can't really fault him for getting there by simply asking people to buy his book, since, you know, that's kinda exactly what we did on October 26th! But it is sort of awesome to have a celebrity beef with none other than Glenn Beck. It's also sort of awesome that he's mad at us for something we did entirely by accident: we didn't put the book out to spite him or to forever ruin his record for #1 book launches, and the only time I even noticed him was when we passed his book while moving from #5 to #2. It was honestly nothing personal, Glenn! For most of the time, we didn't even know you were there.